Nobel woman in rococo gown in the Reign of Louis XV, 1740. Home » Nobel woman in rococo gown in the Reign of Louis XV, 1740. 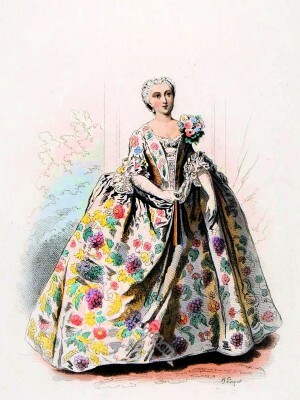 “Modes et Costumes Historiques“. Drawing by Xavier Willemin. Edited and steel engraving by Hippolyte Louis Emile and Polidor Jean Charles Pauquet. Published by Cassell, Petter & Galpin London, 1864. This entry was posted in 1740, 18th Century, Ancien Régime, France, Modes et Costumes Historiques, Nobility, Rococo and tagged Rococo fashion on 12/15/13 by world4.